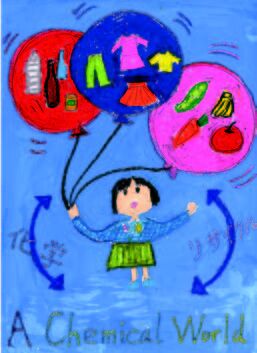 Rikako Yoshida (Age 10), Japan. 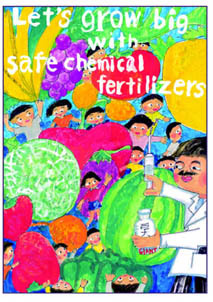 The intriguing images you see on these pages are the 10 winning entries in the “It’s A Chemical World” Poster Competition for students ages 10-16, which was organized by Science Across the World (SAW; www.scienceacross.org) and IUPAC’s Subcommittee on the Public Understanding of Chemistry. 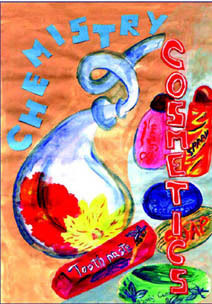 During the joint meeting of IUPAC’s Congress and the Canadian Society for Chemistry (CSC) in August 2003 in Ottawa, Canada, about 30 posters from the competition were exhibited. Among them were the 10 winners of the contest. The display proved to be very popular among the 2500 delegates from about 60 countries who attended the meeting. 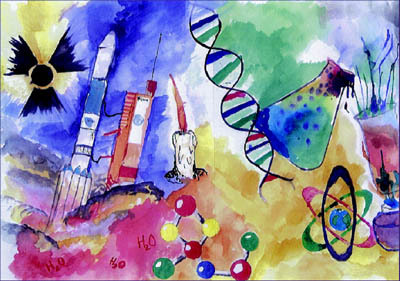 It was stunning to see how these students combined their visions of our chemical world with their artistic skills. Peter Mahaffy (IUPAC), Kathy Darvesh (CSC), and Lida Schoen (SAW) were proud to show these pieces of art and imagination. In August 2002, during the 17th International Conference on Chemical Education in Beijing, China, IUPAC’s nascent Committee on Chemistry Education (CCE) and its subcommittee on the Public Understanding of Chemistry held their first meetings. Chaired by Peter Mahaffy, the subcommittee made plans for various projects and activities, including a workshop to be held in Ottawa during the 2003 IUPAC Congress. During these discussions, an ambitious idea was introduced to organize a worldwide poster competition that would enhance public understanding of chemistry. 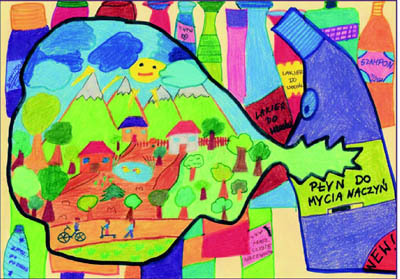 The idea was to ask young people to visualize their ideas about living in a chemical world. It was thought that such an activity would involve students directly, raise awareness internationally, and capture the attention of attendees at the 2003 Congress in Ottawa. Lida Schoen, also a member of CCE, offered the help of the SAW program. All members of the CCE and the entire SAW team were asked to advertise the competition to students, aged 10–16, in their respective countries. Announcements were published on the Web sites of the two organizations and posters advertising the competition were sent electronically to teachers’ magazines. IUPAC and the CSC included notices in their mailings about the joint conference. The results of these efforts were astonishing. Just before the deadline, the metal mailboxes at SAW headquarters in Hatfield, UK, became completely blocked as 255 real pieces of art arrived. SAW’s electronic mailboxes had to be emptied several times per day, because of an overflow of 147 graphic files and PowerPoint presentations. In total, 402 entries were received from 24 countries (see table for breakdown). The entries were divided into two age categories: 10–13 and 14–16. The judging of the entries on paper was conducted by Marianne Cutler and Karen Shoebottom (SAW), who selected a short list of finalists. These entries were professionally scanned and sent to Canada. Lida Schoen dealt with the electronic entries. She asked 25 experienced teachers from six Eastern European countries who were attending a meeting in Varna, Bulgaria, to help reduce her long list. They could hardly manage: too much creativity, imagination, and ability! Both lists were published on the Web site of the King’s University College in Edmonton, Canada. A panel of judges, consisting of Margaret-Ann Armour (chair, Chemical Education Division, Chemical Institute of Canada), Ludo Brandt (Leuven University, developer of DIDAC), Madeleine Jacobs (editor in chief, Chemistry & Engineering News), Fabienne Meyers (managing editor, Chemistry International), and Martin van Os (head of Research and Development, National Centre for School Improvement, Netherlands) chose five prize winners from both age categories. Byung-Chan Kang (Age 16), Korea. The Power of Chemistry Silviu Postavaru (Age 16), Romania. 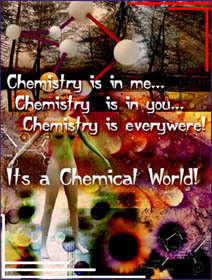 Chemistry is in Me, in You, and Everywhere! 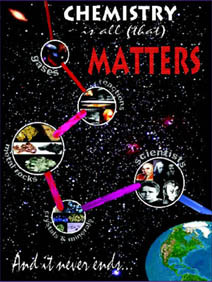 The 10–13 year old winners will receive The Most Amazing Pop Up Science Book, the 14–16 year old winners will receive How Science Works, and all winners will receive a t-shirt and a certificate of participation signed by Marianne Cutler, director of SAW, and Piet Steyn, president of IUPAC. The teachers with the most top-quality entries won one of the three monetary prizes: Can$ 250, 150, and 100 (donated by the CIC/Chemical Education Trust Fund in Canada). 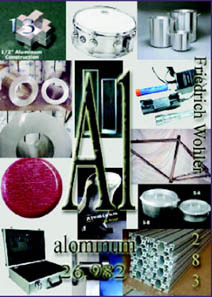 AGFA-Gevaert and the UNESCO Science and Engineering program offered four complete DIDAC sets, which include five books with transparencies illustrating the whole chemistry curriculum, to the winning teachers. Every teacher who entered the contest will receive a CD version of DIDAC, which is to be released this October. A Web gallery with about 40 entries has been arranged on the IUPAC Web site. 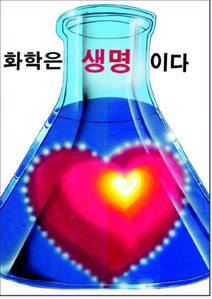 See <www.iupac.org/images/poster/>. For those who did not have a chance to view the display in Ottawa, here they are, simply for your enjoyment! IUPAC and SAW acknowledge the support and donations by GlaxoSmithKline, the Chemical Institute of Canada, the Chemical Education Trust Fund in Canada, UNESCO’s Science and Engineering programme, and Agfa-Gevaert. All our thanks go to the teachers who encouraged the students to prepare posters and to all the students who took part in the contest. Lida Shoen <amschoen@xs4all.nl>, based in the Netherlands, is a titular member of the IUPAC Committee on Chemistry Education and the Subcommittee on the Public Understanding of Chemistry, and is a member of the Science Across the World team. Page last modified 19 January 2004. 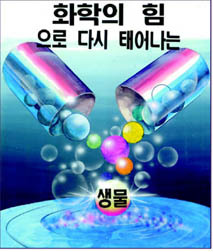 Copyright © 2002-2004 International Union of Pure and Applied Chemistry.